Vanilla comes from the orchid family and is known as Vanilla planifolia. It is the only edible fruit of that family and is the largest family of flowering plants in the world. The current annual demand for vanilla in the United States is 2200 tons. Nearly 300 tons of vanilla beans are used in the U.S. every year just for preparing cola-type drinks. Vanilla is the second most expensive spice in the world, after saffron, due to highly labor-intensive methods of cultivation. It takes between 18 months and three years from planting a cutting of the orchid vine until the plant produces orchids. The orchids bloom and die within a few hours unless they are pollinated by hand. The beans (which are actually seed-pods) must stay on the vine for nine months before being harvested. The beans then go through a curing, drying, and resting process for several months. Each vanilla bean is handled hundreds of times before it’s ready to use. Vanilla has at least 500 organic components that make up its distinctive flavor and fragrance, but only about 250 have been positively identified. Scientists have been trying to genetically clone and reproduce vanilla in a laboratory environment for decades, however, they haven’t been able to capture the elusive and distinctive qualities that make it so popular. The aroma of vanilla is said to calm the nerves and soothe the spirit. Sloan Kettering hospital pioneered experiments with fragrances to soothe patients going through MRI testing. 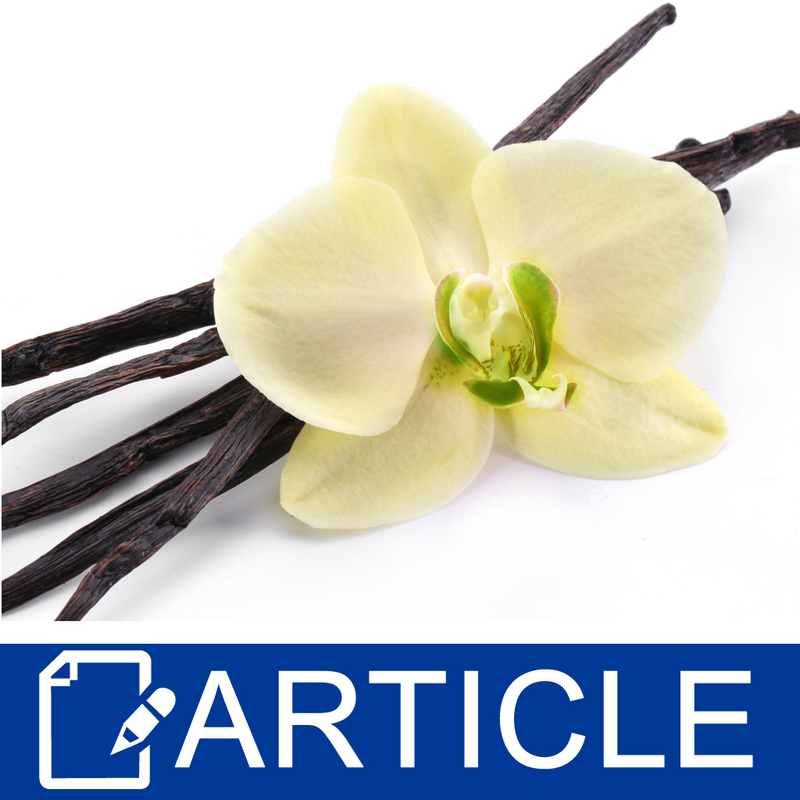 They found that the scent of vanilla helped patients endure the claustrophobic effects of MRIs. The aroma of vanilla is calming and comforting to both animals and humans. This phenomenon helps to explain why vanilla is often used by realtors who want to make their properties seem warm and inviting to potential buyers. Tests conducted at the Institute for Smell and Taste in Chicago found that the aroma of vanilla was a powerful stimulant to men. Another independent poll asked men to identify the scent that “drives them wild,” and while 26% selected floral perfume, gourmand scents (which include vanilla based perfumes), came in a close second at 23%. The vanilla plant is a source of catechins (also known as polyphenols), which exhibit antioxidant activity and serve as anti-inflammatory agents which could make it useful as an ingredient in skincare products. Vanilla essence comes in two forms. Natural vanilla fragrance is a complicated mixture of several hundred different compounds, including acetaldehyde, acetic acid, furfural, hexanoic acid, 4-hydroxybenzaldehyde, eugenol, methyl cinnamate, and isobutyric acid. Synthetic vanilla fragrance consists of a solution of synthetic vanillin in ethanol. Vanillin can now be easily and inexpensively synthesized from various raw materials including rice bran. Vanilla fragrance (whether natural or synthetic) can be blended with almost any other fragrance compound imaginable. It can be sourced naturally for cosmetic products in the natural, premium and luxury arenas. It can also be sourced synthetically when cost effectiveness, availability and consistency are necessary. Vanilla provides a blank canvas for formulators who want to use a familiar, yet exotic ingredient that can be blended successfully with an array of ordinary as well as unusual components to create unique cosmetic and aromatherapy products with broad appeal. Fox, Kate. “The Smell Report.” Social Issues Research Centre. Retrieved 28 August 2014. Cochennec, Corine. "Natural Vanillin Obtained By Means Of Bioconversion." Perfumer & Flavorist, August 2013. Vol. 38, pgs 20-25.